For decades, the United States has entered into Open Skies agreements to foster global competition, lower airfares, and increase consumer choice in aviation. These reciprocal agreements between the United States and other countries create open, competitive markets by enabling airlines, not governments, to make decisions about routes, capacity, frequency, and pricing, based on consumer and passenger demand. Since the first Open Skies agreement was signed in 1992, successive administrations and U.S. airlines have aggressively pushed for these pro-consumer and pro-growth treaties. Today, the U.S. has over 120 agreements with countries around the world. However, three legacy carriers (Delta, American, and United) have waged a more than three-year campaign against two of these agreements, threatening our network of Open Skies. Delta, American, and United have lobbied the previous and current administrations to reopen and renegotiate our Open Skies agreements with Gulf countries based on allegations of subsidized competition, while simultaneously receiving numerous financial benefits and subsidies themselves. If subsidies were truly at the heart of the legacy carriers’ concerns with foreign carriers, we would expect them to be vocal critics of all state-owned or supported airlines. They are not. Rather than opposing such carriers, they partner with at least 28 of them through global alliances. In China, for example, Delta is partnered with China Eastern and China Southern; United is partnered with Air China; and American is partnered with Hainan Airlines. In 2014, these four Chinese airlines received over $1.1 billion in government subsidies. 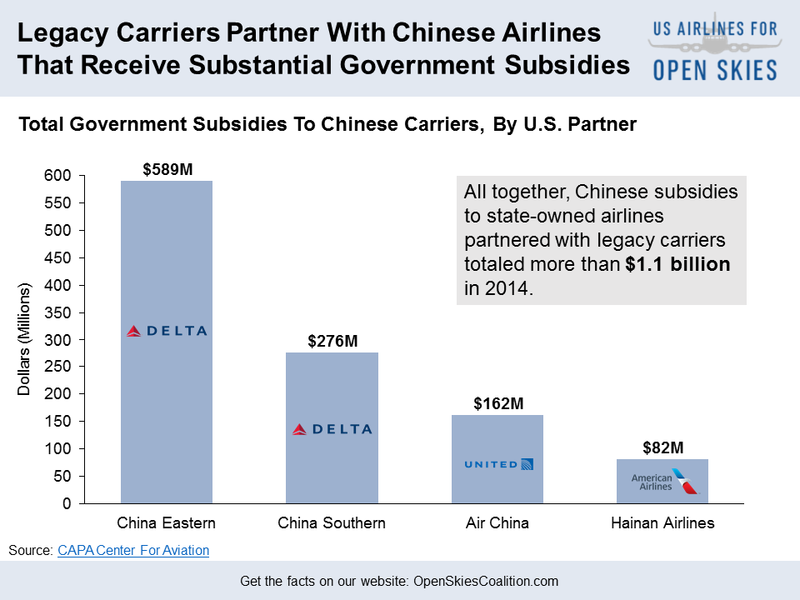 Not only are legacy carriers partnered with Chinese airlines that receive government subsidies, but in the case of Delta and American, they also own part of these airlines. In 2015, Delta purchased a stake in China Eastern, and in 2017, American bought a stake in China Southern, allowing both to directly benefit from Chinese government subsidies. In addition, as legacy carriers hurl accusations against the Gulf carriers, they conveniently ignore the government support they benefit from here in the United States, the largest of which is bankruptcy protection. When a company goes bankrupt, it is able to shed many of its obligations to employees and shareholders while getting rid of unwanted debt. In the case of Delta, American, and United, they have all used bankruptcy to dump their underfunded pension plans and shed debt and leasing obligations. Between 2004 and 2006, due to underfunded pension plans, Delta and United transferred 134,500 participants onto the taxpayer-funded Pension Benefit Guaranty Corporation – United’s 2005 claim, at $6.6. billion, was the largest in the agency’s history at the time. Some legacy carriers also benefit from state government subsidies. When Delta sought to purchase an oil refinery to have direct access to jet fuel for its planes, they received a $30 million subsidy from the Commonwealth of Pennsylvania. And in its home state of Georgia, from 2005 to 2015, Delta benefited from an annual $20 million tax break on jet fuel. This all comes as Delta posted a $4.4 billion profit last year. Under Open Skies agreements, permissions called “fifth freedoms” grant carriers – cargo and commercial – the ability to fly between two foreign countries on a flight that either begins or ends in the carrier’s country. When a Gulf carrier decided to launch a fifth freedom flight between Newark, New Jersey and Athens, Greece, United protested that it could not compete with the airline because it allegedly received subsidies, despite United not even operating a year-round Newark-Athens flight. However, when state-owned Air China announced its intention to initiate a fifth freedoms flight between Houston and Panama City, a route that United flies three times a day, United remained silent. This inconsistency is not coincidental – Air China and United are business partners. The legacy carriers say that they want competitive markets. But their support for free and open skies depends on their bottom line. Bowing to the anticompetitive demands of legacy carriers as they rake in record profits would amount to crony capitalism at the expense of American consumers and the workers who depend on a strong and fair aviation industry.